2.5” SVF25 dual speed, fully rotating focuser with 1.25” and 2” compression ring adapter. 121 mm removable extension. Draw tube is threaded to accept SFF7-25 field flattener. Dual black anodized, hinged, aluminum mounting rings. Rings have five 6 mm threaded holes top and bottom. Holes include one center hole and two holes spaced 1.5” and 60 mm apart. 105 mm diameter main tube. 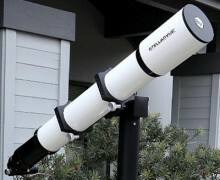 Telescope is 39.25” long with dew shield retracted, 44" long with dewshield extended. Optical tube weighs 11.8 lbs with hinged rings and Vixen rail attached. Click the button below to add the Stellarvue SV102AE-25SV f/11 "Planet Killer" Refractor to your wish list.